Double ended snaps become brittle in single digit temperatures. Muck buckets become brittle in single digit temperatures. Feed pans become brittle in single digit temperatures. Water buckets become brittle in single digit temperatures. Even the most sensible horse will, at least once, lose his mind and go outside to stand in a freezing rain. Some formerly sensible horses will ignore the “open” end of the water tank and start banging on the end that still has some ice on top. The amount of manure produced increases exponentially with the time a horse spends in a shed or stall. When you can’t get traction on 1-1/2 inches of accumulated sleet, you can’t pull even an empty wagon up a moderate slope. Some horses seem to enjoy making loud crunching sound on the ice-coated snow and will happily march through it just for that purpose. Horses in sheds or stalls that can’t see what’s coming are not fond of the sound of a huge monster crunching across the ice-coated snow toward them. Some horses have wicked wicked senses of humor. Readers who would like to follow up on Dr Blanton's article, Feeding the Metabolically Challenged Horse may want to look into these "Horse Courses," offered by THEHORSE.COM. "What's a Horse Course? It's an online video seminar given by experts on a specific horse health topic*. They're all free, thanks to our sponsors. (*Note: Topics are subject to change according to the presenters’ discretion.)" 1. 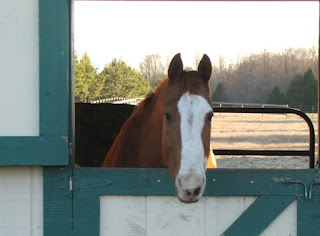 Metabolic Disorders - Equine metabolic syndrome and Cushing's disease. Sponsored by Fort Dodge Animal Health. Available Now. Nicholas Frank, DVM, PhD, Dipl. ACVIM (University of Tennessee)Presented at the University of Kentucky’s Livestock Disease Diagnostic Center in conjunction with the Department of Veterinary Sciences. 2. Pituitary Dysfunction Problems in the pituitary gland of older horses. Sponsored by Fort Dodge Animal Health. Available Now. Dianne McFarlane, DVM, PhD, Dipl. ACVIM, ABVP (Oklahoma State University)Presented at the University of Kentucky’s Livestock Disease Diagnostic Center in conjunction with the Department of Veterinary Sciences. 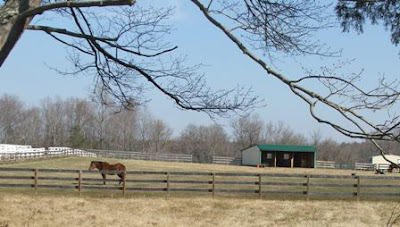 Visit http://www.thehorse.com/Videos.aspx?tab=hc to sign up. Over the weekend, Traveller's Rest met several wonderful people. Thank you to Tabitha and her whole family for stopping by to meet the Elders and drop off some senior feed. As a cold front came through Spotsylvania, we were treated to quite a show by the Goofy Geezers. Rienzi bucked and crowhopped his way along the driveway fence, Emma began to relive former dreams of Thoroughbred glory, while Fitz scampered (if you can say a 17 hand Thoroughbred "scampers") in circles in his unique way, head waggling, tail in the air. Who says "old" horses don't enjoy retirement? Thank you, too, to Jean for bringing more blankets, as well as coolers, pads and leg wraps. Please come again when you can stay longer. TREES welcomes visitors by appointment Monday-Sunday, between 10AM and 2PM. (Evening hours will be available during summer.) If you would like to meet our residents and learn more about the sanctuary, please email info@equineelders.org or call 540-972-0936. Wade will be watching for you! Overweight horses (body condition score 7-9) require a strict program of dietary management and exercise. It has been shown that the risk of developing insulin resistance (IR) increases as the length of time a horse is overweight increases, and studies have shown that IR horses are more likely to develop laminitis. As a result, it is imperative to get the excess weight off these horses. 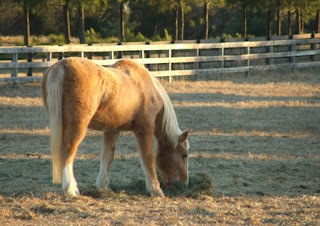 Obese horses should be fed a diet of hay plus a vitamin and mineral supplement. Since they will be receiving no other calories, these horses should be fed enough hay to meet their energy requirements: 1.5-2.0 % of their body weight. This is equivalent to 15-20 pounds of hay per day for a 1000 pound horse. ** Obese horses that are not actively laminitic should also be exercised daily to further reduce weight. The key here is to avoid excess sugars and carbohydrates. Most sugars in a normal horse’s diet come from pasture grasses. 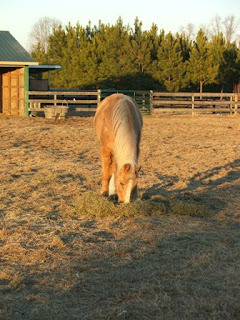 As a result, when managing IR ponies or horses, you must restrict or eliminate pasture from the diet. Options for pasture restriction include strict dry lots, use of a grazing muzzle, free grazing for 1-2 hours a day and strip grazing with electric fencing. It has been shown that grasses are highest in sugars during dynamic stages of growth. Therefore, it is important to avoid grazing during the following times of year: spring (when grass is growing quickly and turning green,) early summer (when grass is starting to dry out,) following heavy summer rains (when grass is rapidly growing,) and fall (when grass is entering winter dormancy.) Sugar content in pasture grasses also varies with the time of day. Sugar content is low early in the day and high later in the day. As a result, it is best to graze horses with metabolic issues in early morning versus late afternoon. However, since each case is different, consult with your veterinarian to determine the best option for you and your horse. Unlike the obese horses, some horses with endocrine disorders (lean horses in regular work and/or ribby horses with regional adiposity) will require supplemental calorie sources. How do you increase caloric intake without increasing the sugars and carbs that can lead to IR? If your horse is one of these and needs to be fed a concentrate, look for those feeds that are low in sugars and carbohydrates. Dividing the feedings into smaller, more frequent meals is a great way to decrease your horse’s natural glycemic response to each meal. It is also good practice to feed hay before concentrates to slow the transit from the stomach to the lower digestive tract where many carbohydrates are broken down into harmful sugars. You will also want to feed a hay that is <12% non-structural carbohydrates. To achieve this, you can send away hay to be tested or you can soak your hay for 60 minutes in cold water (30 minutes in hot water) prior to feeding it to your horse. 2. Gordon, M.E. et al. The effects of dietary manipulation and exercise on weight loss and related indices of health in horses. Longview Animal Nutrition Center, Land O Lakes Purina Feed, Gray Summit, MO. 3. Gordon, M.E. The Effects of Nonstructural Carbohydrate Content and Feeding Rate on Glucose and Insulin Response to Meal Feeding in Equine. ** TREES note: Feeding only hay may not be possible in elder horses with advanced dental problems. Talk to your vet about finding a suitable replacement. Not a whole lot to say, other than "Can you believe this gelding will turn 38 this spring?" This, of course, is Sonny, our herd patriarch. Sonny regularly defies the notion that old horses are sedate, passive creatures. He gallops in for meals, moves the other horses out of his way with "a look," and bucks his way across the field after tolerating annoying things like farrier or vet visits. Sonny has been undergoing treatment for Lyme Disease for the last several months (more on that in a future post) but to look at him today, its hard to tell he was ill at all. 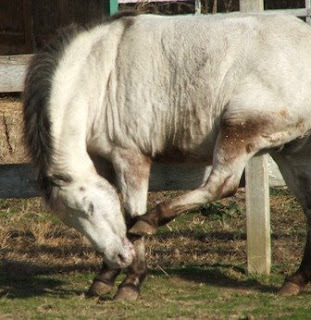 Laminitis, or "founder," is a problem that can affect any horse or pony of any age or breed. Join the staff of the Rappahannock Equine Veterinary Clinic for an educational seminar, following a case renowned farrier Eddie Shelton has been working on in conjunction with REVC doctors. They will present the case, its work-up, findings, current progress, and treatment plan. Achieve a better understanding of hoof anatomy and physiology, as well as the mechanics of laminitis. Learn how to minimize risk and reduce the likelihood of founder through herd management practices. Ask questions as farrier and veterinarian work side by side to make their patient more comfortable. Space is limited and is expected to fill quickly. Reserve your seat today! We really need to come up with some sort of award for folks like those who helped catch up on cleanup yesterday and today. After several raw, windy days we found ourselves looking at many times the usual amount of manure in the sheds, small paddocks and other sheltered loafing areas. But, forks and muck carts in hand, our volunteers met the challenge. Special Thank Yous to Gene, Carol, Deborah, Jim and Mike, who as a team filled the old 1949 John Deere manure spreader THREE times over. (And we're talking a big spreader here, not one of the little models you can pull with a lawn mower.) All the water tanks were scrubbed and refilled, stalls bedded, and one frozen outdoor hydrant repaired. Whew! The horses, on the other hand, took advantage of the warm, calm day to catch a few naps. Must be nice! President Elect Obama is calling on Americans to make MLK Day a day of service....a "Day On" rather than a day off. While many service projects are geared toward needy humans, we'd like to appeal to potential volunteers for a few hours to help needy horses. With the recent unusually cold, windy weather, the horses have been spending more time in sheds and barns. That, added to poop piles frozen to the ground has caused a "back-up," so to speak. By Monday, everything should be thawed (including our spreader, and the muckers' fingers and toes!) and we'll have some extra cleaning up to do. If you have not yet chosen a "Day On" project, and would like to spend a few hours with our Elders, volunteering in a reduced stress environment, please give us a call at 540-972-0936, or shoot an email to info@equineelders.org. On behalf of Traveller's Rest Equine Elders Sanctuary, I'd like to say Thank You! to the staffs and customers of the Culpeper CFC Farm and Home Center and the Orange-Madison Farm Co-op Service for their gracious support. The two stores hosted "Giving Trees" during the month of December to help the sanctuary acquire feed and commonly used supplies. During a time when many are struggling financially, we were overwhelmed by the generosity of co-op customers who share our feelings about Equine Elders. Co-op shoppers donated everything from senior feed to rice bran, vetrap to gauze sponges, shampoos, probiotics, grooming supplies and more. Thank you all for remembering formerly forgotten friends during the holiday season. We couldn't care for them without you.